Posted 4th January 2012 & filed under Blog, Environment. In the second of her blogs from China, Xiao Mei looks at the environmental challenges faced by China, and wonders who will be the main agents for change. Building a consensus among nations on how to save the world seems to remain a “mission impossible”, but no one today will doubt the significance of China’s position on issues of climate change. During the UN Climate Conference (COP17), held in Durban from 28 November to 9 December, the public appearances of Xie Zhenhua (leader of the Chinese delegates) never failed to attract large crowds of reporters from countries around the world. This is not only due to China now being the largest emitter of greenhouse gases, but also because of its diplomatic power in the tussle among major countries on how to share the burden and responsibility of protecting the environment. For example, during the Durban Conference, Canada and the US repeatedly emphasized that a legally binding treaty would be unacceptable unless China agreed to be bound by it first (they still stand aloof from the agreement on the second commitment period of the Kyoto Protocol, despite the fact that China is in). In November,China’s State Council (equivalent of the Cabinet) released a White Paper outlining China’s achievements on recycling, reforestation and industrial efficiency, as well as plans to cut carbon emissions relative to GDP by 40–45% by 2020. China also shows consistent interest in collaboration with European countries on clean energy technologies, and has been an active force in the establishment of the Green Climate Fund, to help developing countries to reduce greenhouse gas emissions and face up to the challenges of a rapidly changing climate. Some of the more specific plans include the expansion of installed generation capacity of biomass power – such as marsh gas generation and garbage incineration – to 13 million kilowatts by 2015. Last summer the central government also launched a trial programme in five cities (Shanghai, Shenzhen, Hangzhou, Hefei, and Changchun) to encourage the purchase of clean-energy cars by subsidizing electric vehicles. Government subsidy for environment-friendly programmes even extends to sea burials in Shanghai, which challenge the very old cultural tradition of land burial in China. 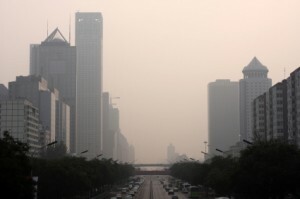 While China is playing a more significant role on the world’s stage, and becomes increasingly comfortable with its status as one of the major powers, its capital Beijing is desperately trying to combat the poisonous smog that invades this ancient city and is suffocating its people. No matter what its diplomats or officials say in Durban, Chinese people – especially the metropolitan dwellers – are much more deeply troubled by the air they breathe to live. “PM 2.5” recently has become a catchphrase in the Chinese media. The PM 2.5 index measures the amount of small particulate matter in the air that reportedly could do serious damage to one’s lungs once inhaled, even causing death. Children and the elderly are especially in danger. A famous anecdote goes like this: on an ordinary day in Beijing, the Beijing Environmental Protection Bureau describes the level of air pollution as “slight”, while the US embassy in Beijing– which has its own measure of air quality – labels it “hazardous”. Failure to include the PM 2.5 index is believed to be a major reason behind this huge discrepancy. While facing grave challenges in its struggle with the rapid deterioration of the environment, some people in China have expressed hopes that non-profit organizations and grassroots environmental groups could play a more flexible and constructive role. However, experience has shown that the involvement of university students in environment protection is more likely to be a short-term social activity in the context of campus life, rather than a life-long commitment. As soon as they enter their senior years in university, the tasks of looking for a job or preparing for graduate school entrance exams will occupy most of their time and passion. Moreover, most of the activities organized by young people’s organizations rarely go beyond doing surveys, producing guidelines, raising awareness, or attending various kinds of conferences. It is no surprise that many of China’s NGOs try to avoid tackling sensitive issues: not only their legal status but also their channels for funding rely directly on authorisation from the government. As long as it remains risky for NGOs to contradict the official stance on environmental problems, the amount of pressure they can put on the government to implement environment-friendly policies will be seriously limited. The government’s report from the 2012 annual Central Economic Work Conference, which closed on 14 December, acknowledged the enormous challenges faced by China to carry out action to cut CO2 emission to protect the environment, while maintaining steady economic growth and social stability. It is not that the Chinese government is feigning its sincerity to protect the environment, but it cannot do all the work, and cannot act as the powerful but lone actor. Without truly independent and efficiently run NGOs standing as an active force in putting pressure on the government and helping ordinary citizens, the future for environmental protection remains bleak. The younger generation, who will be most affected by environmental damage in the long run, should also be actively encouraged to become the main protectors of the fragile environment.